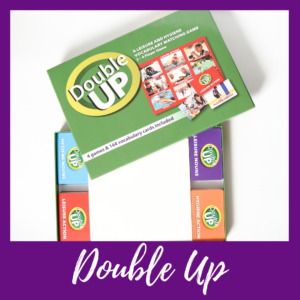 Learn all about our newest game Double Up from creator Rosemarie Griffin, CCC/SLP, BCBA! If you are working with older students, I know that you have probably struggled with finding materials that were age appropriate. I am a school based speech language pathologist and board certified analyst. I created Double Up to help my students strengthen their vocabulary and leisure skills. If you are a special education teacher, speech language pathologist, board certified behavior analyst or parent – you will love Double Up. 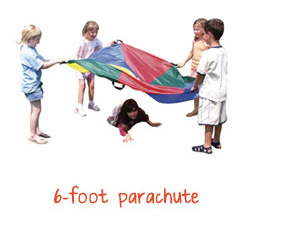 This product can be used with students who are non-verbal and by students who are conversational. 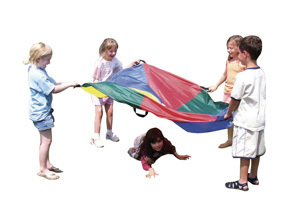 A no prep social skills activity for mixed groups!! Double Up includes 4 different games and 144 vocabulary cards. 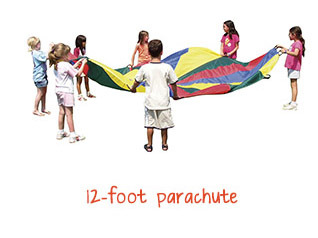 It can be played with as few as one person or as many as 4 people. Vocabulary terms focus on the areas of leisure and hygiene. The first person to fill up their board- yells “Double Up” and they are the winner. Read below for skills that you can work on when playing Double Up. 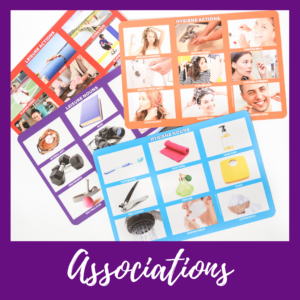 Associations – Students can work on matching items by association. If you pass out the purple leisure noun boards, get out the red leisure action vocabulary cards. You will turn over a leisure action ( i.e. reading), if you have the picture of the book on your board – you match it! If someone else has the book – you can pass it to them or ask “who has the book?” A great way to play for students who understand word associations. 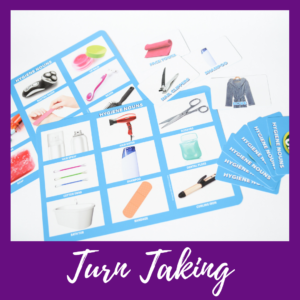 Turn Taking – Double Up allows for practice with turn taking. Picking a card and taking your card is a functional leisure skill. The format of this game, allows for many opportunities to take your turn and wait while others take their turn. 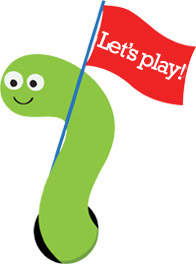 Waiting – If you play Double Up as a 4 person game- your students will have to wait for their peers to take a turn. This is a natural way to work on the skill of waiting. Waiting can be so very difficult for our students and this is a great way to embed work on this skill. Independent Work. Double Up also makes a functional independent work task. 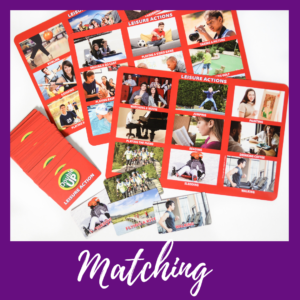 A student could take one board from the double up game and the matching cards. They would match the identical cards for an independent work task. The pictures are functional and age appropriate, so not only are students work on increasing their duration with an independent task, they are being exposed to words that are important to them! Conversation Skills – The pictures in double up lend themselves to conversation. You can discuss the vocabulary terms with the students. “Have you lifted weights before?” “Have you been camping?” The conversation opportunities are endless! In this installment, we’re introducing Sam’s Modified Instructions for Shopping List, one of our favorite memory games. Shopping List is an adorable memory game that also develops personal and social skills. The goal of the game is to be the first to fill your cart with all of the items on your shopping list. It is designed with the objective to have players fill a trolley with the items on their shopping list. However, there are multiple games and activities that can be played with these materials to meet the specific needs of your learners. Included in the game are 4 cardboard carts, 4 shopping lists, and 32 beautifully illustrated items with dry-erase surfaces. 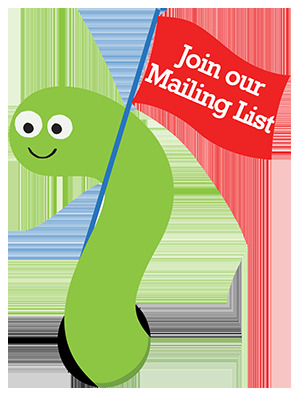 Don’t forget to download our free Modified Instructions for Shopping List today!